Sherman Alexie’s stature as a writer of stories, poems, and novels has soared over the course of his twenty-book, twenty-year career. His wide-ranging, acclaimed stories from the last two decades have established him as a star in contemporary American literature. 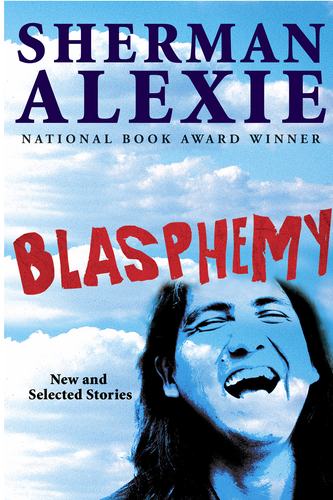 A bold and irreverent observer of life among Native Americans in the Pacific Northwest, the daring, versatile, funny, and outrageous Alexie showcases all his talents in Blasphemy, where he unites twelve beloved classics with twelve new stories in one sweeping anthology for devoted fans and first-time readers. Included here are some of his most esteemed tales, including What You Pawn I Will Redeem,” "This is What it Means to Say Phoenix, Arizona,” The Toughest Indian in the World,” and his most recent, War Dances.” Alexie’s twelve new stories are fresh and quintessential, about amateur and donkey basketball leagues, extreme hoarding, lethal wind turbines, marriage, and all species of contemporary warriors in America today.